Kids love Bible stories and they love computers, so why not combine the two? Featuring favorite stories from the Old Testament, this lively interactive program will delight your 3- to 7-year-olds with its lyrical text, colorful pictures of nature, and numerous animated surprises. Most of all they'll enjoy exploring the story by themselves with just a click of the mouse! 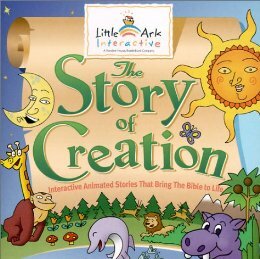 Long ago there was nothing...then God made dry land, water and mountains from the seas... and so the Little Ark interactive The Story of Creation unfolds... Bringing an important and timeless story to life! In this richly animated tapestry of words and pictures, everything on Earth, deep in the sea and high in the sky comes to life, accompanied by song and dance and exuberant celebration. Each colorful page of the story entertains with an array of animated surprises and original musical interludes kids can click on again and again. Your children can choose to have the story read to them, or explore it with the click of a mouse.